Can you really make sesame seed-free hummus that is as delicious as the sesame-laden original? Well, after much messing around in the kitchen, I think this comes pretty close. And all that time in the kitchen means that I’ve done the hard work for you: literally chuck it all in the blender and zap, it’s done. Both Miss Mini Yummers and myself have a sesame seed allergy, and although lots of food has sneaky sesame seeds in it in a low quantity, the thing I really crave is hummus, which is absolutely full of the stuff. Seriously, it’s just like concentrated sesame paste with some chickpeas thrown in. It’s my kryptonite, and I’m no Superman! But luckily, although I’m not equipped with x-ray vision and super strength (not since the last time I had to stop a speeding bullet), I am equipped with some feisty cooking knowledge and a sturdy blender. Yes, they are super powers! * rapeseed oil is especially good in this recipe as it adds to the golden, creamy colour–a lot of homemade hummus can look a bit sad and greyish. 1. Drain your chickpeas and reserve the water. Crush the garlic. 2. 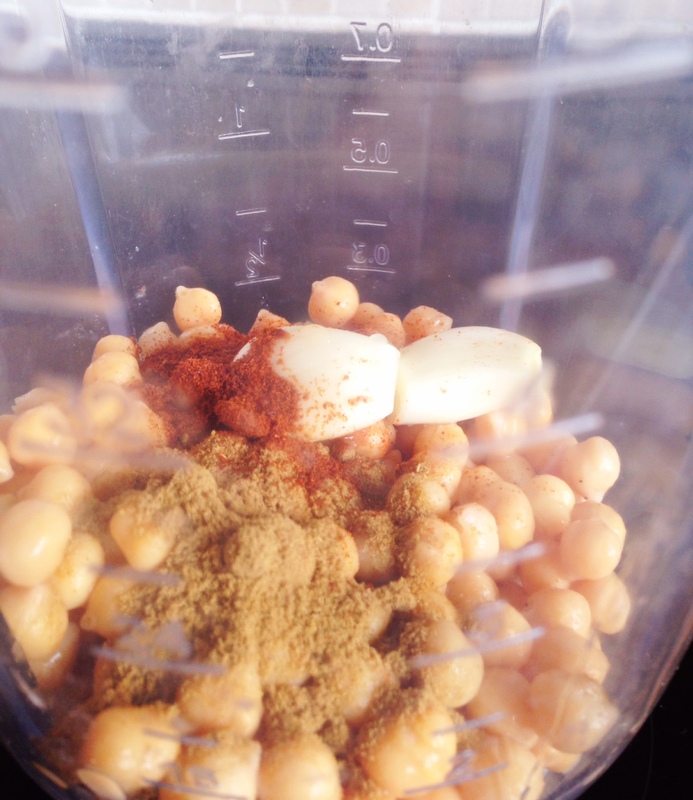 Throw all the ingredients into the blender, along with 5 tablespoons of the chickpea water, and… blend. 3. Add more water if you need to. You’ll probably need to jiggle the blender around to make sure it blends everything, or push down the sides of the mix with a spatula, when the blender isn’t on. It takes a few zaps to make sure all the ingredients are blended, but even Superman needs a few goes before he gets it right. And yep, that’s it! Sesame seed free hummus is made. Not my longest post, but it definitely works! 1. 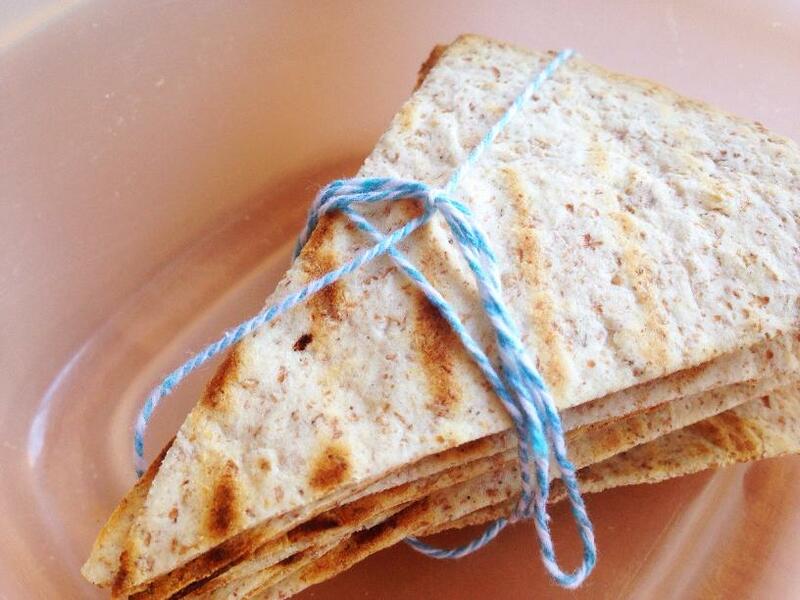 Using scissors, use some tortillas that are past their best, and cut each one into eight sections. Heat up a griddle pan/frying pan/skillet with no oil. 2. Place your tortilla triangles into the pan and heat until they are brown/golden on the bottom. Flip over and cook until they are crispy. Chickpeas have been around for thousands of years. 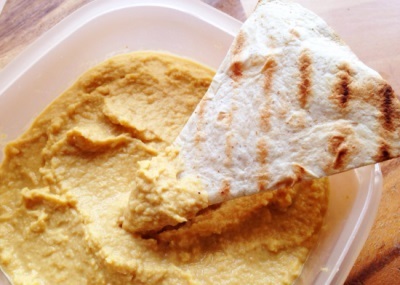 Hummus is one of the oldest prepared foods. Although it is popular in the Middle East and India, no one really knows where hummus comes from originally, or who invented it. 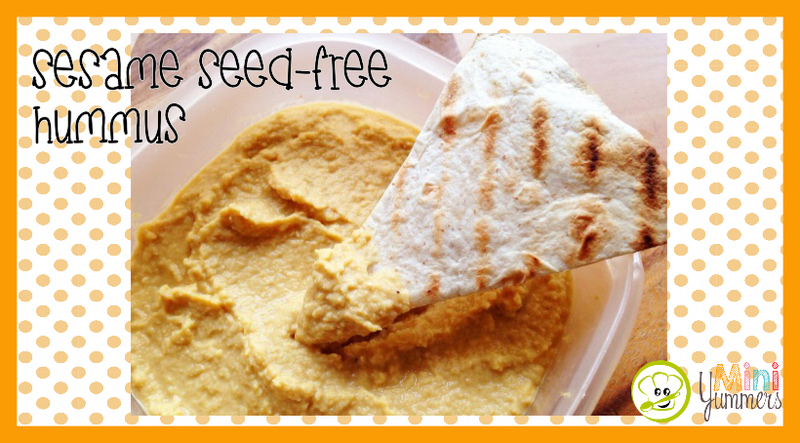 Hummus is full of protein, is high in iron and vitamin C, and is a good source of fibre. 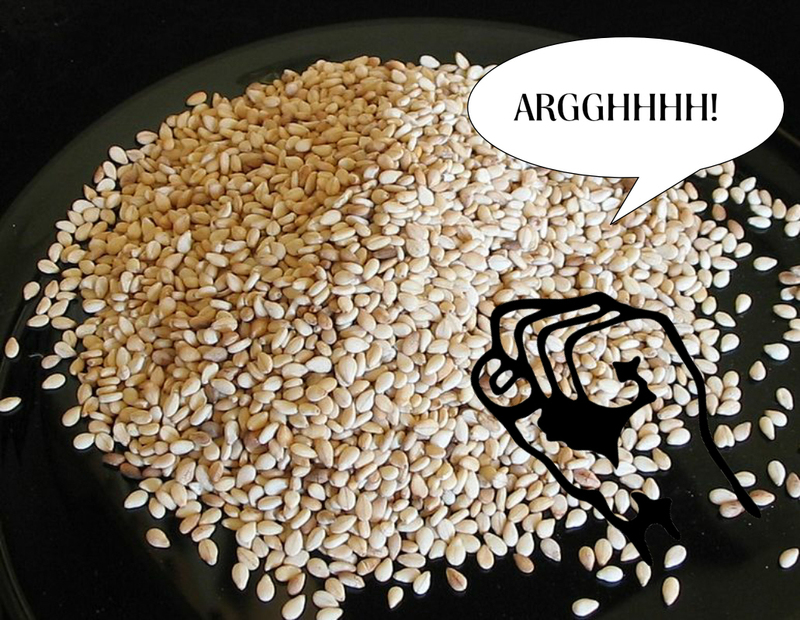 Know any friends or family who have a sesame seed allergy? Why not share this post with them. Or let us know if you have any other allergies that you’d like to see recipes for.